Papuloerythroderma of Ofuji is a rare disease whose exact etiopathogenesis is still unknown. It was first described by Ofuji et al. . It usually affects elderly men and is characterized by generalized and intensely pruritic eruption of flat-topped red-to-brown coalescing papules with sparing of skin folds and creases . 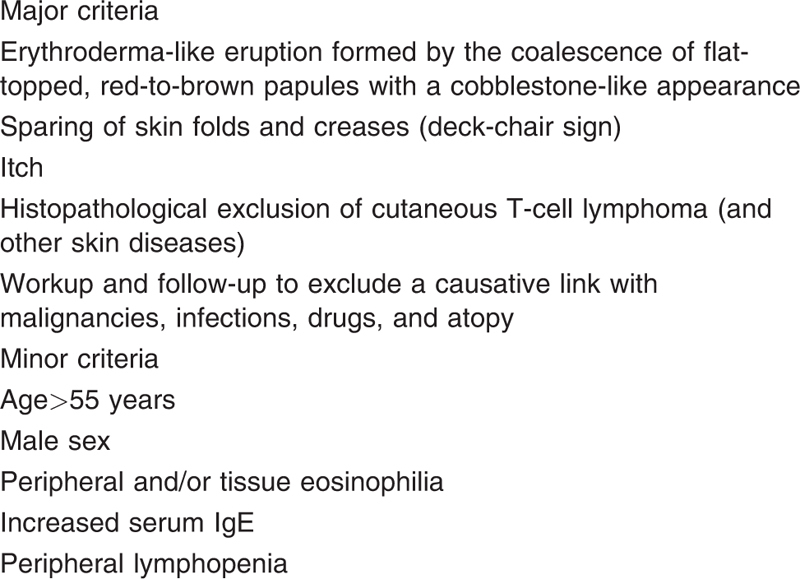 Etiology remains enigmatic and has been associated with malignancies, infection, drugs, and cutaneous T-cell lymphoma . We report a case of papuloerythroderma of Ofuji with characteristic clinical features but with no underlying malignancy. A 72-year-old man presented with red raised lesions over whole body since the past 4 years. The lesions were associated with intense pruritis. There were several episodes per year, and the lesions never subsided completely. There was no history of new drug intake and atopy. There was no history of weight loss, and his appetite was normal. His general physical examination was within normal limit. There was no significant lymphadenopathy. His systemic examination was unremarkable. On mucocutaneous examination, there were multiple erythematous flat-topped papuloplaque lesions covering upto 90% of the total body surface area. Lesions were predominantly distributed over extensors with sparing of skin folds and flexures. Over trunk, deck-chair sign was present with sparing of abdominal folds ([Figure 1]). Face, palms, and soles were spared. Oral mucosa and hair were normal. Nails were shiny in appearance. Clinical possibility of papuloerythroderma of Ofuji and mycosis fungoides was kept, and patient was investigated. Complete hemogram revealed eosinophilic leucocytosis with total leucocyte count of 17 900/mm3 and 25% eosinophils. Buffy coat for sezary cells was negative. His liver function test, renal function test, random blood sugar, chest radiographs were within normal limits. Serum IgE level was increased to 780 IU/ml. Ultrasound abdomen and kidneys, ureters, and bladder were done to rule out any malignancy and were found to be normal. Skin biopsy showed stratified squamous epidermis showing acanthosis and hyperkeratosis. Dense chronic inflammatory infiltrate was seen in the papillary dermis predominated by lymphocytes with perivascular cuffing of lymphocytes. Moderate amount of eosinophils were present scattered within the dermis and around capillaries. There was no evidence of malignancy, and histopathological findings were suggestive of papuloerythroderma of Ofuji. On the basis of characteristic clinical features, histopathology, and laboratory investigations, diagnosis of papuloerythroderma of Ofuji was made. Patient was started on oral prednisolone 30 mg daily, which was gradually tapered, along with azathioprine 50 mg, twice daily, antihistamine, and emollients. 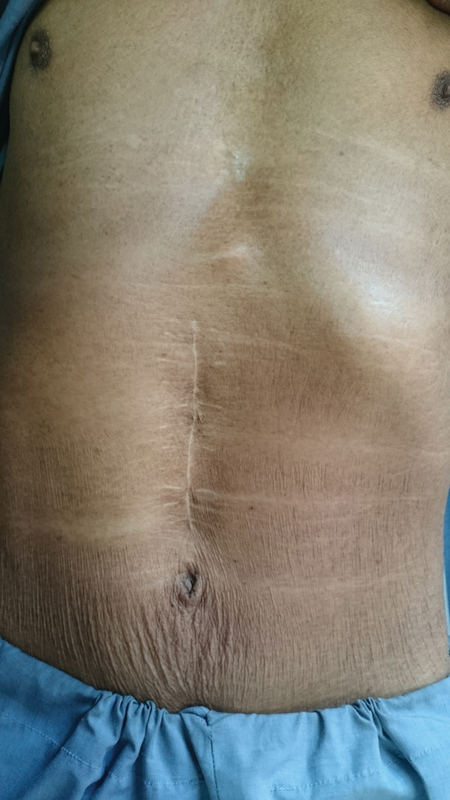 There was significant improvement at the end of 4 weeks, and patient is on further follow-up. Figure 1 Over trunk, deck-chair sign was present, with sparing of abdominal folds. Papuloerythroderma of Ofuji clinically presents with multiple polygonal erythmatous papules that spare the body folds. It is accompanied with intense pruritus, lymphadenopathy, peripheral eosinophilia, and raised serum IgE level . Deck-chair sign, that is, sparing of abdominal folds, is highly characteristic of papuloerythroderma of Ofuji but has also been observed in erythroderma owing to atopic dermatitis, psoriasis, imatinib-induced rash, cutaneous Waldenstrom’s macroglobulinemia, angioimmunoblastic T-cell lymphoma, acanthosis nigricans, erysipelas, discoid lupus erythmatosus, contact dermatitis, and leprosy, and can be idiopathic. ,,. Histopathology consists of mild hyperkeratosis, acanthosis, focal spongiosis, and perivascular lymphocytic infiltration, with eosinophils in the upper dermis with absence of atypical lymphocytes . It is proposed that pathogenesis involves Th2 lymphocytes directed toward specific, unknown antigen, which can be neoplastic, microbial, pharmacological, or self-antigen. These lymphocytes produce soluble mediators which induce the proliferation, activation, and migration of eosinophils and other cell types into the skin, which then enhance the cutaneous inflammation . In a meta-analysis of 170 patients by Torchia et al. , the average age of patients was 73.42 years. Male to female ratio was 4 : 1. The median duration of rash was 7 months. Deck-chair sign was present in all the patients. Most patients had trunk and limbs involved with sparing of face and scalp. Palmoplantar keratoderma was present in 20.43% and dermatopathic lymphadenopathy in 24.73%. Mucosa, hair, and nails were spared. Peripheral eosinophilia was observed in 85.32%, lymphocytopenia in 29.36%, and increased serum IgE in 50.46%. Atopy was associated in 20.31% of patients. Malignancy was present in 21.76% of patients, which included solid organ and hematological neoplasms. Few patients developed cutaneous T-cell lymphoma on follow-up. Torchia and colleagues proposed the diagnostic criteria of the disease as given in [Table 1]. In our patient, all the major and minor criteria were fulfilled except peripheral lymphopenia. There was no underlying predisposing factor in our patient. Similar cases from India have been reported by Prasad et al. and Gulati . Treatment modalities include psoralen ultraviolet-A therapy, topical and systemic steroids, etretinate, cyclosporine, and interferon . As this disease is associated with internal malignancy and cutaneous T-cell lymphoma, proper follow-up of these patients should be done even after remission of cutaneous lesions. Ofuji S, Furukawa F, Miyachi Y, Ohno S. Papuloerythroderma. Dermatologica 1984; 169:125–130. Prasad D, Gautam RK, Kar HK, Jain RK, Bhardwaj M. Papuloerythroderma of ofuji. Indian J Dermatol Venereol Leprol 1995; 61:299–300. Torchia D, Miteva M, Hu S, Cohen C, Romanelli P. Papuloerythroderma 2009: two new cases and systematic review of the worldwide literature 25 years after its identification by Ofuji, et al. Dermatology. 2010; 220:311–320. Prashar A, Narang T, Saikia UN, Dogra S. Deck chair sign in lepromatous leprosy. Lepr Rev 2013; 84:252–254. Shenoy MM, Bendigeri MA, Kamath PR, Vishal B. Diffuse leprosy with ‘deck-chair’ sign. Indian Dermatol Online J 2015; 6:204–206. Teraki Y, Aso Y, Sato Y. High incidence of internal malignancy in papuloerythroderma of Ofuji: a case series from Japan. Dermatology 2012; 224:5–9. Gulati R. Papuloerythroderma of Ofuji: is it a homogeneous entity? Indian J Dermatol Venereol Leprol 2003; 69:37–38. Mutluer S, Yerebakam O, Alpsoy E, Ciftcioglu MA, Yilmaz E. Treatment of papuloerythroderma with Re-PUVA; a case report and review of therapy. J Eur Acad Dermatol Venereol 2004; 18:480–483.